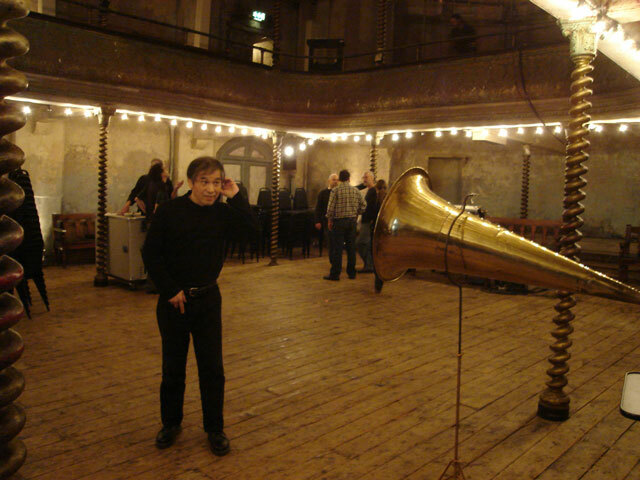 Recorded at Wilton’s Music Hall, London, on November 4th, 2010. Tetsuo Kogawa’s interests range over a variety of disciplines and critical approaches. After studying philosophy at Sophia and Waseda universities, he taught at Wako University for 17 years. He is currently Professor of Communication Studies at Tokyo Keizai University’s Department of Communications. Kogawa introduced free radio to Japan, and is widely known for his blend of criticism, performance and activism. He has written over 30 books on media culture, film, the city and urban space, and micro politics. Most recently he has combined the experimental and pirate aesthetics of the Mini-FM movement with internet streamed media. Recorded after a soundcheck during the Cut & Splice: Transmission Festival where Tetsuo was to perform later that evening. The preparation for this recording involved his winding of two large copper Tesla coils, and once completed, I set the phonograph running and Tetsuo played the radio waves. A remarkable one-of-a-kind recording.